“When ambition ends, happiness begins,” Thomas Merton, a Trappist monk and mystic wrote. My husband, Papa Duane, and “I,” “Gammy Jill,” just spent a few unambitious and happy days with our 19-month-old grandson, Silas, in Massachusetts. The days were full and exciting watching him explore the world. There are many lessons to learn from this little one and his constant companion, Newfoundland pup Shiloh. Both are attuned to the joys, possibilities, and magic of our world. “Happiness is not a matter of intensity but of balance, order, rhythm and harmony,” Thomas Merton declared. Silas and Shiloh expect the very best from people and are rarely disappointed. They spend as much time as possible out of doors delighting in the sights, sniffs, and sounds of nature. They are not afraid to try new things—foods, experiences, books, and toys. They accept and master new challenges whenever they arise, like climbing uneven, steep steps and rocky or rutted terrain. They share toys and treats without a fuss, and warm up and comfort each other when a cold snap arrives. They are quiet and only speak when necessary with a “woof” or “Momma.” Sign language comes in handy with a shake for “yes” or hands high for “yea!” They wear smiles and see the world as a place to delight and discover. They accept everyone and spread love all around, warming hearts and tickling souls along their way. We took Silas forest bathing at a nearby state park where a pond shimmered through budding trees and rhododendron will soon burst forth in a colorful cacophony. Silas never hesitated along the pebbled path, and forged full steam ahead to meet new friends: toddlers on the covered bridge mastering stairs together. We watched fisher folk pull in lake trout and picnickers feast on jelly and peanut butter. We wound our way past the bat house and a small stone structure controlling dam water. Silas played ball with a 3-year-old and tested a red, two-seater wagon just the way Dada and Papa admire and test drive a shiny new car. Another day we ventured forth to a Trappist monastery just up the road called St. Joseph’s Abbey. Silas ran on the lawn, stood on a crooked tree, gobbled up grapes, and drank apple juice. Inside the dark chapel, heavenly light filtered through stained glass windows of brilliant blues, and Gregorian chants mesmerized me for a spell. heralds of spring, forsythia, purple hyacinth, crocuses, and yellow daffodils, but mile after mile, full blossoms transformed back to promising buds, and red tipped branches re-donned their grey winter robes. Winding rivers, full of melted snow, raced around hillsides that stretched upward to become the Green Mountains. Sun-starved patches of lakes still held thin ice as we drove along further north. As it turns out, while growing up in Brooklyn before the family bought the farm, young Leonard knew Thomas Merton. Both boys would later become Trappist monks, an order of the Cistercians, and find their homes in sister abbeys. Brother Leonard helped build the St. Joseph Abbey, stone by stone, where he lived to be over 100 years old, while Thomas Merton joined the Gethsemane Abbey in Bardstown, Ky., following years of study in Europe and America. Upon arrival, I told my Killington writer/anthropologist friend about our adventures and the abbey because she’d recommended Thomas Merton’s writings to me in the past. “Check out ‘The Seven Story Mountain,’ his fascinating autobiography,” she said, so at last I looked him up. What a life Thomas Merton led from his birth in 1915 until his untimely passing in 1968. What a great thinker, poet/writer, social activist, theologian, and mystic he was. Born in the French Pyrenees near the Spanish border of a New Zealand artist father and American Quaker artist mother, he lived between France, N.Y. and England throughout his childhood and studies. He attended Cambridge and Columbia universities, and wrote 70 books on spiritual and social justice issues and on pacifism. He worked in the Harlem Friendship House, developed a lifelong love of jazz, and studied the Cistercian sign language used by silent monastic orders such as his own. Even as a young man, Merton believed that all religions “lead to God, only in different ways, and every man should go according to his own conscience, and settle things according to his own private way of looking at things.” He believed in an interfaith approach to understanding one another and met with many of the world’s greatest religious leaders and thinkers including the Dalai Lama, D.T. Suzuki of Japan, Tibetan Buddhist Dzogchen master Chatral Rinpoche, Vietnamese Buddhist monk Thich Nhat Hanh, and wrote books about Zen Buddhism and Taoism. Merton studied Native American spirituality, Hinduism, Jainism, and Sufism. He studied the early Christian Desert Fathers (Gnostics) and mystics and found their commonalities with the nature of Zen philosophy. He believed that non-Christian faiths could offer Christianity a renewed perspective and experience, as in the idea of Zen Catholicism which has similarities to the monastic Christian tradition. “The whole idea of compassion is based on a keen awareness of the interdependence of all these living beings, which are all part of one another, and all involved in one another,” Merton wrote. I wish Thomas Merton, who died at age 53, could have lived twice as long like his boyhood friend Brother Leonard. I wish his voice of reason could now guide us through the perilous footing of Tomahawk and inter-continental ballistic missiles and careless tweets that put all our world in danger. When I look at little Silas and Shiloh and the sweet, innocent way that they live in the world, I only hope and pray that our earth will still exist and be fit to live on for their future. “If you want to study the social and political history of modern nations, study hell . . . Peace demands the most heroic labor and the most difficult sacrifice. It demands greater heroism than war. It demands greater fidelity to the truth and a much more perfect purity of conscience,” Merton concluded. Marguerite Jill Dye is an artist, writer, occasional poet, and constant seeker of spirituality, beauty, and justice. She lives in Vermont and Florida with her husband Duane. 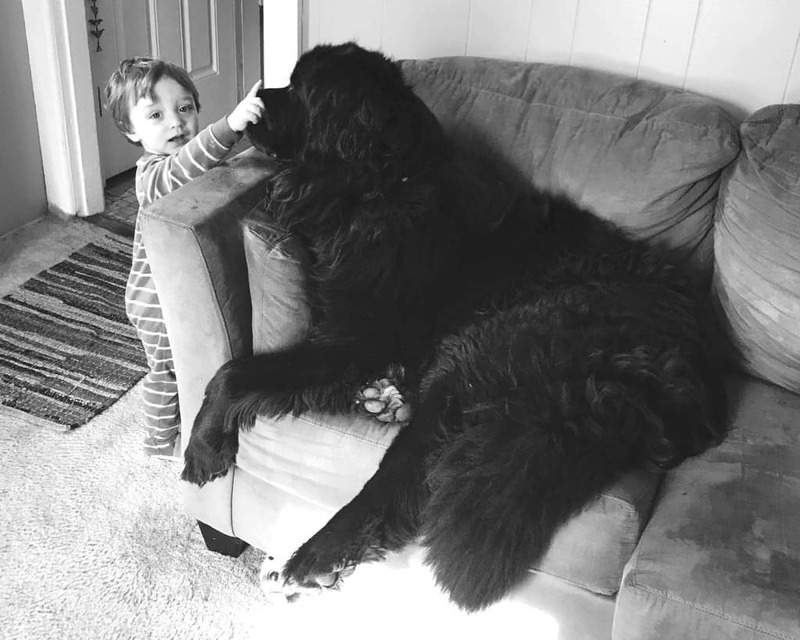 Dye’s grandson Silas, left, adores his best buddy Shiloh, a young Newfoundland. Always glad to read more impressions of Merton. He was truly one of a kind and could never be boxed into any normal category. He was one of a kind. I spent several years with him as one of his novices at Gethsemani Abbey in the 50s and had some communications with him up to his death in ’68. He has no peers but many wonderful followers many of whom have abandoned the confused mess of the established churches to pursue the great mystery of God’s presence in the world. He was a true gift to mankind. Jill, it was good to hear your voice. You were so kind to me in Richmond when I had just moved there in 1991 and knew barely anyone. I enjoyed this, and read it to my husband. We love Merton’s work. Thank you for these reminders of all that is important.